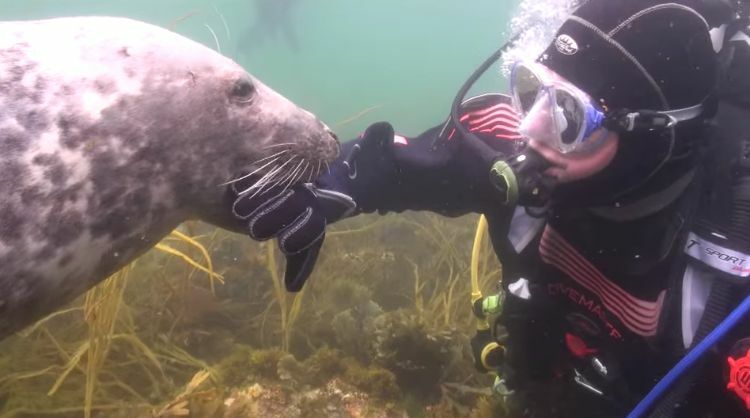 A diving trip near the Scilly Isles, United Kingdom, became a playground for videographer Gary Grayson and a couple of young grey seals. Looking like wet spaniels with enormous, black marbles for eyes, these seals were as curious about Gary as he was about them. 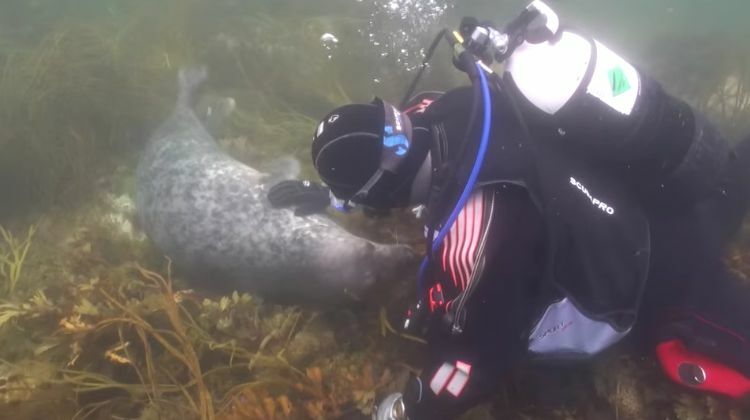 Peculiarly, this colony of grey seals was tolerant of humans, letting the diver get close enough to interact in a pretty personal way. Normally skittish, seals don’t ordinarily hang around when people get near, but the seals that live around this cluster of rocks are not only tolerant—they seem to welcome visitors. 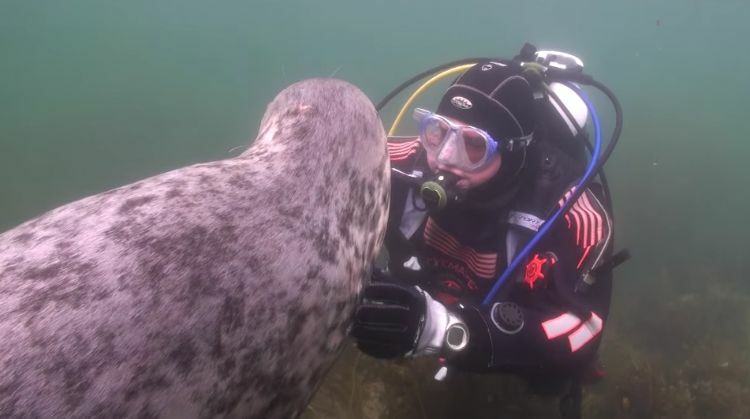 Most divers have to dive for many days before the seals trust their appearance enough to investigate. They can spend most of their time just waiting for the seals to swim by. Fortunately for Gary, these youngsters were more curious than cautious. The marine animals that seem clumsy on land are lithe, swift, and graceful in the water. They are also surprisingly fast, able to swim circles around sharks. It is notable that these pups stayed close to Gary under the water. Grey seals are true seals, pinnipeds (meaning feather-footed) with shorter front fins and without external ears. The adults can reach 8 feet and 800 pounds! 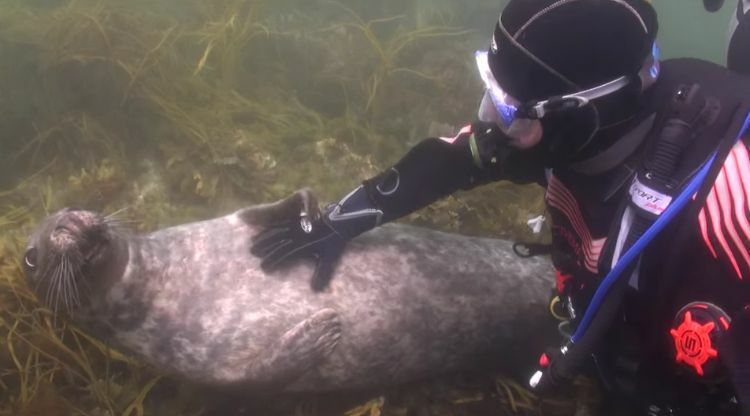 The seal rolled over on his back for a belly rub, which he seemed to enjoy, judging by his expression. 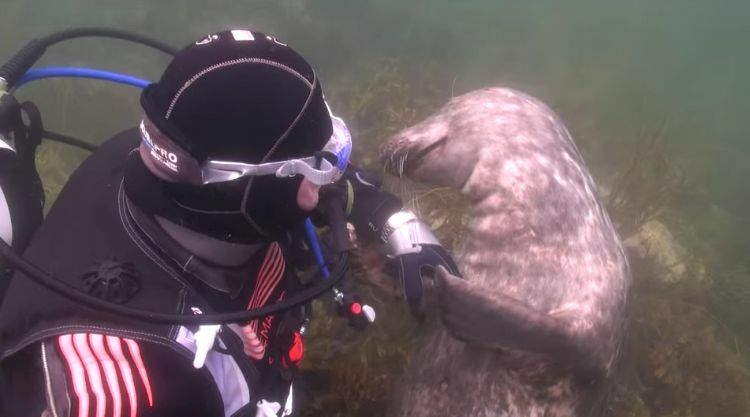 Rubbing the animals side elicited obvious pleasure, and the seal was enjoying every minute of the attention. 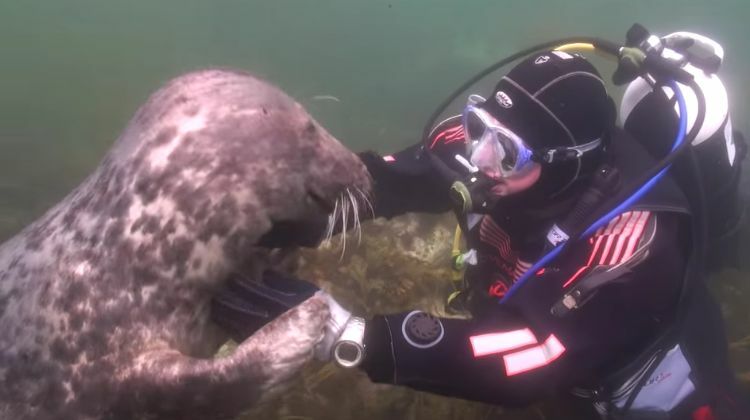 When the little seal took a taste of Gary’s gloves and wetsuit, the diver was up close and personal with the seal's razor-sharp teeth. 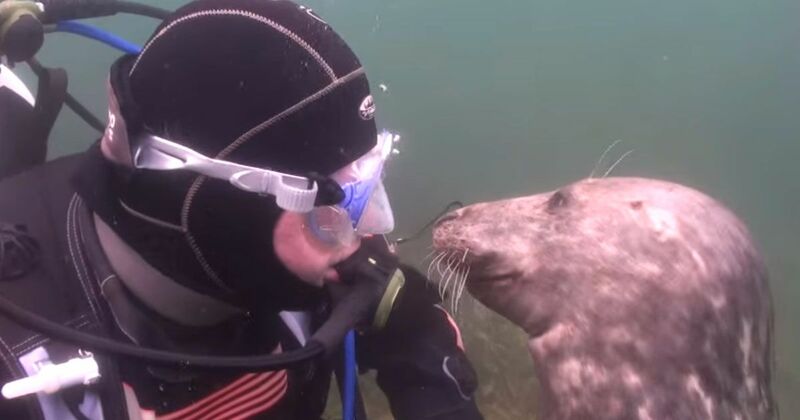 The seal gently mouthed Gary but obviously didn’t mean him any harm. 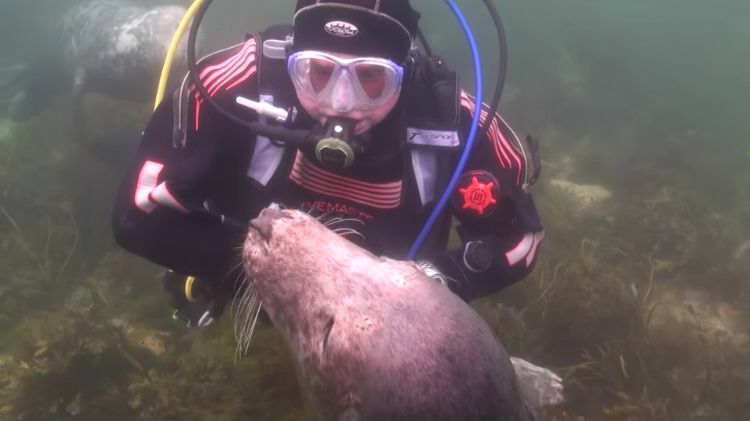 Although most seals species are on the endangered list, with videos like this one showing a more “human” side of the picture, perhaps that can change. 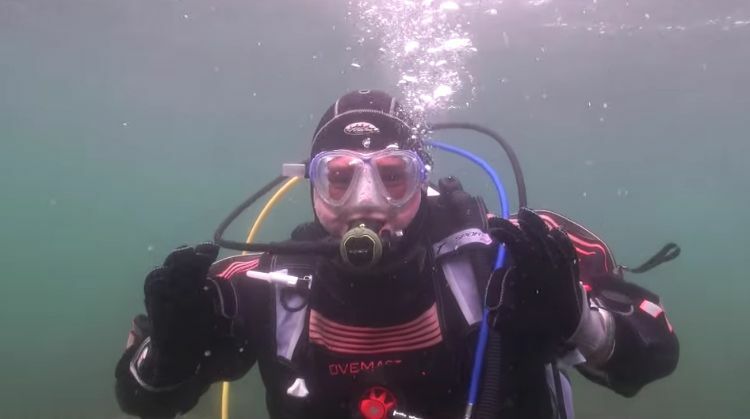 Maybe someday the oceans will again teem with these captivating creatures of the deep that seem so much like undersea puppies. Share this delightful video with your friends on Facebook!